The EFAF Board of Directors has agreed to accept the application of the German federation AFVD to host the 2010 European Championships. The games will be played in Frankfurt, with the Commerzbank Arena serving as the main venue. 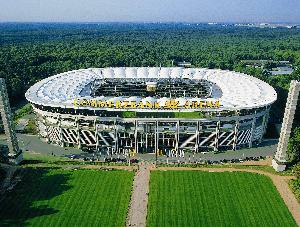 Commerzbank Arena is also the host for the German league’s finals. Two other stadiums will also be used in the 2010 European Championships. Playing in group A will be Germany, Finland and the winner of the 2009 qualification tournament. The teams in group B are the reigning European Champion Sweden, Great Britain and France. Three of the teams will be accomodated in the Athlete Village at the Sportschool of the Hessen Sports Federation. The Sportsschool was also the main place of accomodation at the World Championships in 2003. The other teams will be staying in hotels in Frankfurt. The AFVD has a long tradition of hosting international tournaments in American football. In addition to the 2003 World Championships the 1989, 2000 and 2001 European Championships were played in Germany. European Junior Championships have been played in Germany four times (1994 Berlin, 1996 Frankfurt Rhein-Main, 1998 Düsseldorf Rhein Ruhr and 2000 Berlin). AFVD has 31 000 organized members and 270 clubs playing American Football. TV channel DSF has announced its interest broadcast the 2010 European Championships. DSF is the partner of AFVD for live broadcasts of the 2008, 2009 and 2010 German Bowls.